George Graham Reviews Wolftron's "Fresh and Fears"
There seems to be a kind of musical personality that recurs that I suppose it could be called the "obsessive popster." There are usually solo artists, but often band members who seem to labor at length in the quest of the perfect pop songs. Brian Wilson of the Beach Boys is the archetype. Paul McCartney also did that on his a couple of his post-Beatles solo albums. Such artists persist into today, and over the past couple of years on this series, we have spotlighted Brian Scary and Jason Reeves, both of whom created sophisticated, clever but instantly likable music. This week we have another stellar example. 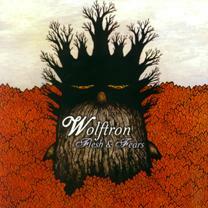 It's a CD called Flesh and Fears by Wolftron. Wolftron is essentially a one-man group, in the person of Kenny Choi, a 23-year-old Korean-American resident of Kent, Washington. Known for his work with the band Daphne Loves Derby, which we also reviewed last year, Kenny Choi had an early start. Daphne Loves Derby formed in 2002 when a then-14-year-old bassist named Jason Call heard the band that high-school sophomore Choi was in, and instant-messaged him with an invitation to jam, and together with drummer Stu Clay, the band got under way. Jason Call was a bit of a prodigy and was completing college courses simultaneous to his high school, so finding rehearsal time took some effort. But they persisted, and began to attract interest in their music on-line, eventually scoring many thousands of downloads. The band has so far released a couple of EPs, and two full albums. Meanwhile, Choi has been doing lots of side projects, usually with alias group names, including Deperado's Revenge, and Des Rev, Sorry About the Fire, and Camerafone. Flesh and Fears is at least his fifth solo recording, this time under the name Wolftron. For a 23-year old, Choi has had a lot of practice doing this kind of thing and it sounds it. The CD is just dripping with dulcet, airy vocal harmonies, tunes that stick in your head, and tasteful production that really sweats the details, done, by the way, in his bedroom by means of lots of overdubbing. Choi plays all almost all the instruments and layers all the vocal harmonies that make this CD so appealing. The only other musician heard is drummer Jason Edwards, who plays on most of the tracks. But this is most assuredly a Kenny Choi record. Choi draws his influence from different generations, but this is definitely a CD that will warm the cockles of the hearts of Beatles and Beach Boys fans, and those who remember some of the clever melodic pop of 40 years ago -- a generation before Choi was even born. This is a sunnier-sounding, more retro project than the last Daphne Loves Derby CD. Goodnight Witness Light also emphasized melodic pop, but would fall into some alternative rock cliches, like songs with soft verses and loud, grungy choruses. Flesh and Fears has all of that stuff shaken out, and is stripped down to the really timeless elements, and the songs are fairly brief and to the point, ending as they leaving you wanting more. The CD ends with Simple Sunshine done mostly as a kind of solo performance. Compared to the more meticulously layered instrumentation elsewhere, this seems more intimate but is not quite at the level of the rest of the album. Flesh and Fears the new CD by Wolftron, the latest solo project by Kenny Choi of the band Daphne Loves Derby is another of those great recordings of clever, sophisticated but mellow retro pop. It's one of those perfect summer albums. Choi manages to make a make an instantly appealing melodic pop recording without getting too sweet, and like all the best pop, it combines the easy-going sound with musically interesting ingredients that will reveal themselves with subsequent listenings. Sonically, the CD also gets in the region of a Grade "A" from me. It may have been recorded in the respective bedrooms of Choi and drummer Jason Edwards, but the sound is first-rate. The studio effects, especially the dreamy reverb added to the music, are tastefully handled, and add another tier of sonic interest. Unlike many pop albums, the recording is not too badly compressed, allowing some ebb and flow to the music. There seems to be another new generation of obsessive popsters, in the quest of the perfect pop song. I have noticed that many of them have been quite young -- perhaps it's youthful enthusiasm, plunging like a young athlete or computer whiz into single-minded pursuit of goal. And early 20s is probably the best time for a guy to hit those high vocal harmonies. In any case, Kenny Choi's latest project as Wolftron is very impressive indeed.